What are the Benefits of TOGAF? The Open Group Architecture Framework, more commonly referred to as ‘TOGAF’, is one of the world’s most popular standards for enterprise architecture. Offering both a succinct framework and a tried and tested methodology for enterprise architecture development, TOGAF is used and applied by organizations across virtually every industry. But what are the brass tacks benefits of a TOGAF certification? When it comes to enterprise architecture, corporate jargon tends to get thrown around a great deal. This can make it difficult to understand exactly how and why so many businesses are implementing TOGAF, beyond simply being able to boast that they use enterprise architecture. 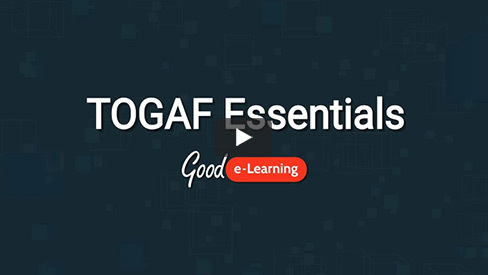 In this video, Mike from Good e-Learning looks at the biggest benefits of a TOGAF certification for both users and businesses. Good e-Learning is an award-winning online course provider for TOGAF and enterprise architecture. We even won the ‘Outstanding Certification Product’ prize at The Open Group Awards 2018, which was hosted by the organization which develops TOGAF. Our enterprise architecture courses cover the entire TOGAF certification spectrum. The TOGAF Awareness course offers an excellent introduction to the framework, while students seeking TOGAF certifications can opt for the TOGAF Foundation or TOGAF Certification packages. We also combine TOGAF with the ArchiMate modeling language, a top-rated tool for enterprise architects, in the TOGAF 9.2 Certification & ArchiMate 3 Practitioner Suite. Even those who are already TOGAF-certified can benefit from studying with us, as the TOGAF Essentials 2018 course can help them bridge their knowledge from TOGAF 9.1 to 9.2. Want to hear more? Browse our full portfolio of Business & IT courses or visit our FREE downloads area for a wide range of posters, whitepapers, case studies and more from leading industry experts.